After the plague sweeps through the population of the greater New York City area, Lucy finds herself alone, devastated by the loss of her family, friends and life as she knew it. Survival is a day to day struggle with never enough food. One day Aidan shows up, saving her from the dogs that seem determined to catch her, and leaving her longing for human contact again. When a tsunami pummels her makeshift home, Lucy scrambles to escape and ends up finding Aiden and the tattered group of people he lives with. Sweepers keep attacking and taking people away, never to be seen again. Lucy is frustrated by the group’s lack of action, wanting to find out why people are being taken and where they are going. When a girl escapes the sweepers and returns back to the group, Aiden and Lucy decide the time has come to find some answers, setting off a chain of events that nobody could imagine. The answers, it seems, are in Lucy's blood. I first have to say that I'm really enjoying so many of the books coming out in the Dystopian genre. This was no exception. I thought Lucy was a strong character. Life had forced cruelties upon her but she survives. She sets her mind to the task and does what needs to be done. Lucy also has a sense of loyalty which I really liked. The author does a good job of creating characters. I felt like I could picture them in my head. They seemed real and tangible. The premise of the book was interesting and incorporated so many of the things that I think as a society we fear happening. Massive virus or infection that sweeps across population, devastating everyone, government propaganda leaving us confused as to the truth... yeah, scary stuff. The one problem I had with the book was the ending. Here I am, in the middle of this intense escape scene, running for my life, trying to get away, and then Aidan pulls Lucy over and kisses her. THE END. Huh? Okay, so I'm as happy as the next gal that Aidan and Lucy finally connect that way but I really felt like I was escaping with them, running with adrenaline and then BAM, I turn around and everyone is gone. There is an Epilogue which provides some after the fact answers, but still. That ending. I don't know. Bah, ending spoiler! My eyes, my eyes. Well - I'll still be looking forward to reading this one. I love a good dystopian! Huh, this is one of those dystopian/post-apoc books that I've seen a lot around, but haven't been too interested in. Now I'll have to take a closer look. I like the sound of this book! 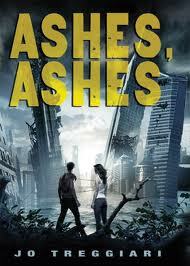 I am in love with post-apocalyptic books right now. This sounds like it could be my next pick. Sorry about the spoiler. I wasn't thinking! I'll do better next time. great review! i've been wanting to read this book for a while now. i absolutely love dystopian books! I tried reading this last summer and didn't get very far. I just remember her catching and eating the turtle at the beginning. Maybe I'll pick it up again if I hear a sequel is coming. It sounds like it gets better, until the ending?? I do enjoy dystopian and post-apocalyptics.